Enjoy a convenient way to buy and read our books! 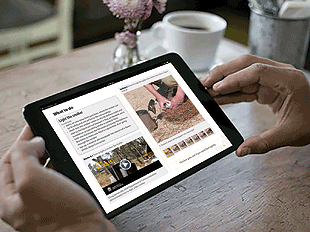 Most of our publications are available as ebooks and can be purchased through the iBooks app and from Google Play. You'll need an Apple ID to pay for books from the iBooks app, or a Google account to buy books on Google Play. If you have an Apple iPad, you will be able to download enhanced books (multi-touch books) shown right. This format offers an interactive experience where the books come alive with features such as image galleries, videos and more. When our books are updated, you receive a notification to download a free updated version from the store. Librarians, our publications are available in the EBSCO eBook collection. Just search Tocal in the Publisher field. This is an up-to-date guide to which books are currently available on the iBooks and Google Play platforms. Pasture "weeds" of Coastal NSW (multi-touch) NEW! Pollination using honey bees - AgGuide (multi-touch) NEW! Pollination using honey bees - AgGuide NEW! Tocal Property and Farms - Multi-touch book NEW!